I guess you all know David, not only Biblical hero, famous king from the Old Testament, but also a masterpiece of Renaissance sculpture created at the beginning of 16th century by Michelangelo (no, not the ninja turtle). The statue is 17 foot high and it is placed in Accademia Gallery in Florence and the copy of it you can find on public in front of Palazzo Vecchio in Florence. But back to the original statue. It was carved from the marble from Carrara, which is the city in Northern Tuscany in Ligurian Apennines. 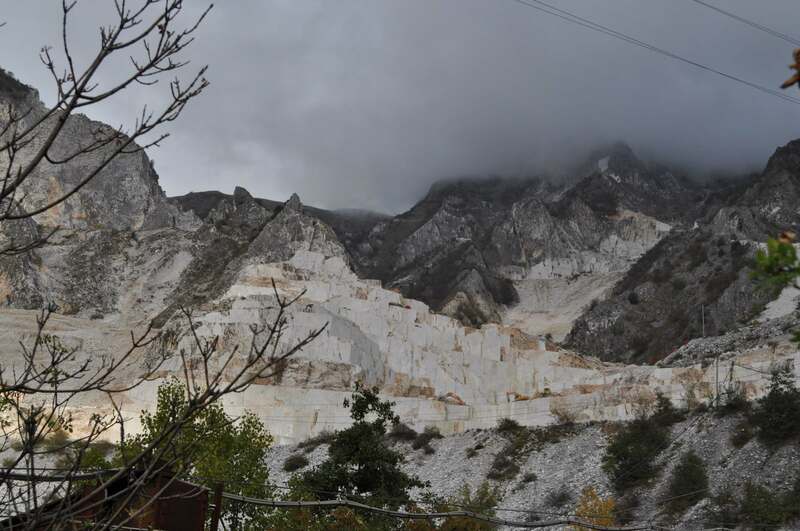 The marble quarries are located above the city in the mountains and already from afar you can see snow white hill sides shining in the sun. I am not surprised that Michelangelo chose this material for his masterpiece; you can visit the house in Carrara where he lived, when he was looking for the material for his other works there. 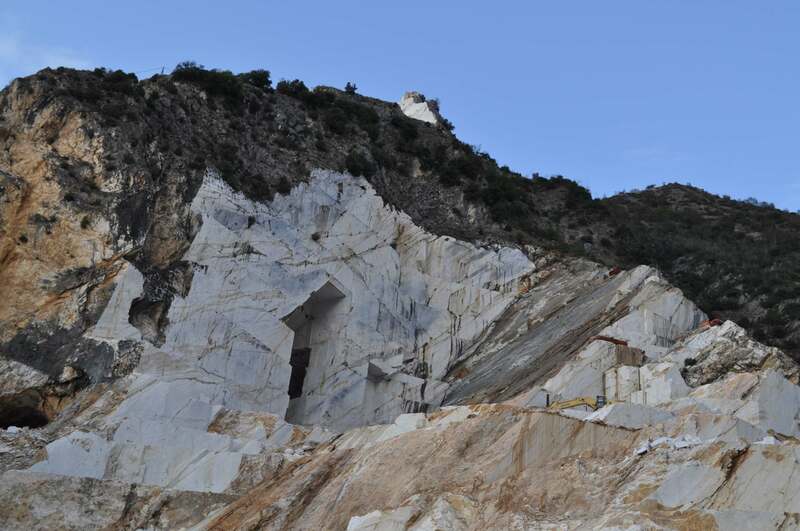 During our trip to Tuscany we decided to visit one of the marble quarry in Carrara. 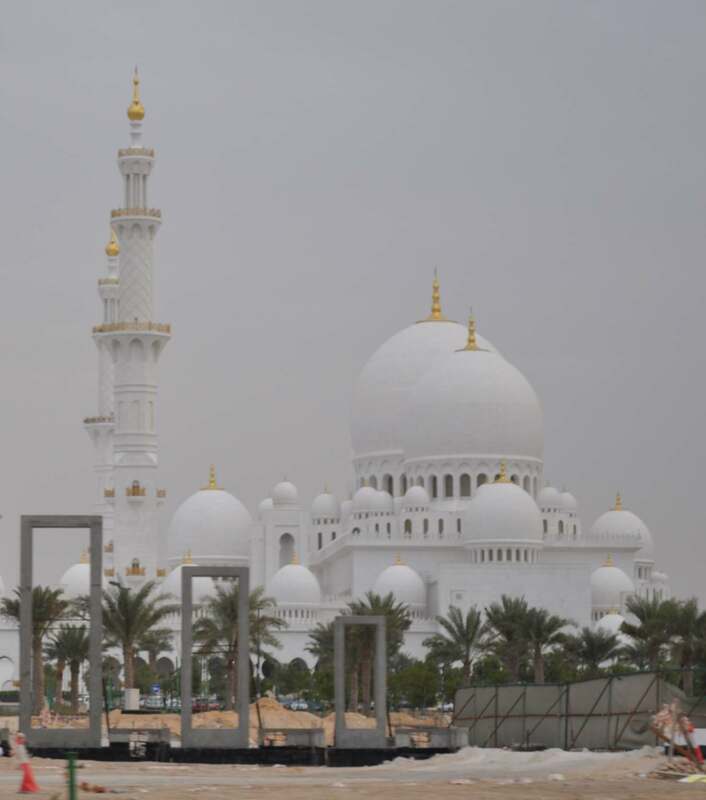 The marble from here is used since the time of Ancient Rome and you should check on the internet, where in the world you can see it (like interiors of Manila Cathedral, the cold-white marbles of the Sheikh Zayed Mosque and the campus of Harvard Medical School). 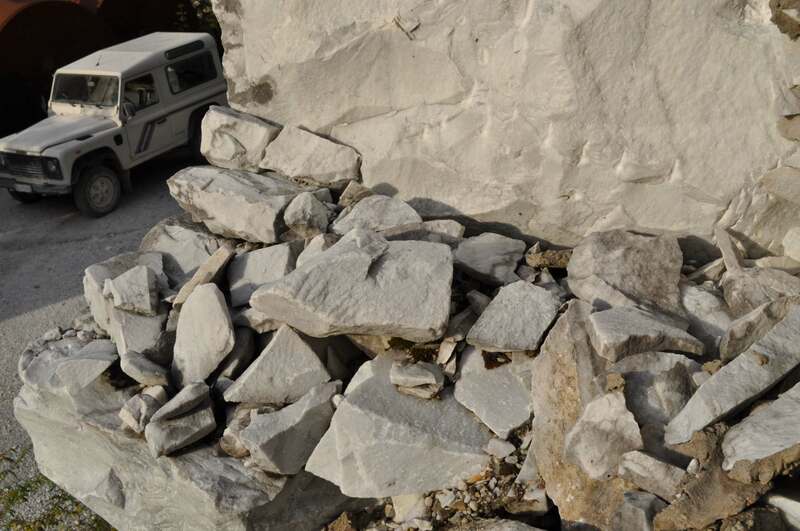 We drove our car through the city, slowly climbing up the mountain, choosing one of many signs to “Cavo di marmo” (marble quarry). And we were getting higher and higher and the street was more and more arduous, soon we saw a sign 15 degrees and later on 18. To be honest I haven’t seen this one, I was so concentrated on the street and full of fear, my eyes wide opened and my breath almost taken away. The car was going on the lowest gear and I felt like it is going to turn on its back every minute, I believe it was neither 15 nor 18; it must have been 45 degrees at least! 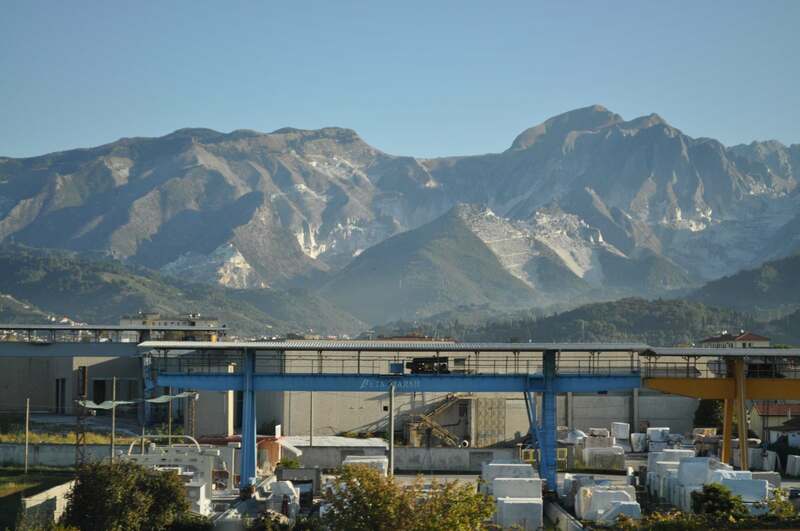 We drove between the quarries up and up to the place called Ravaccione, where are the ruins of the stone cutting factory. There we left the car, I found my breath again and we had time to admire the brilliant views. For sure I also collected some small pieces of the white glittering stones for my desk and my mother’s garden. The place really has its magic; everything is covered with white or lightly grey dust, the water in the spring looks more like milk, the small pieces of marble are shimmering in the bright light. After taking a huge number of pictures and much smaller number of marble pieces we went back down. This direction was not that scary, also we met a track loaded with big pieces of marble going down with us. On some places it went through the washing places where its chassis was showered and cleaned, so the streets in the city down there were not covered with a white mud. So if you have a trip to Italy, I highly recommend visiting this place, for its raw beauty and strangeness. 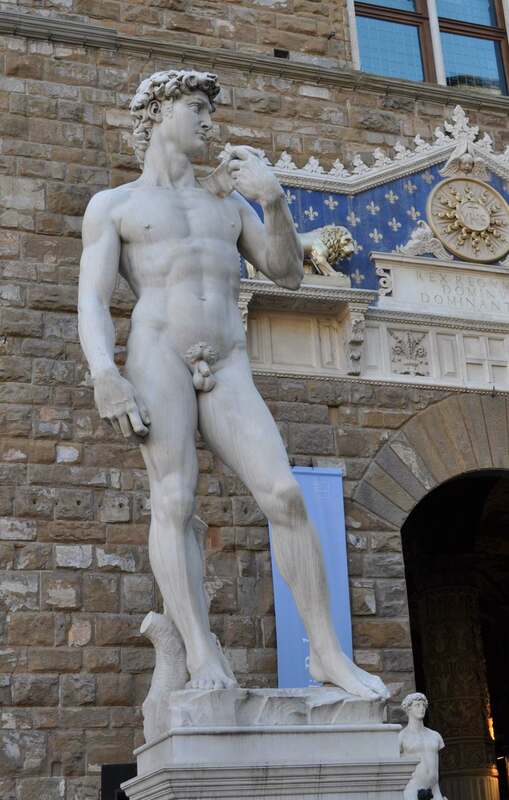 And don’t forget to go to Florence to see the David statue, but I think this one I don’t have to admonish. By the way if you are really interested, you can have your bathroom made from Carrara’s marble. 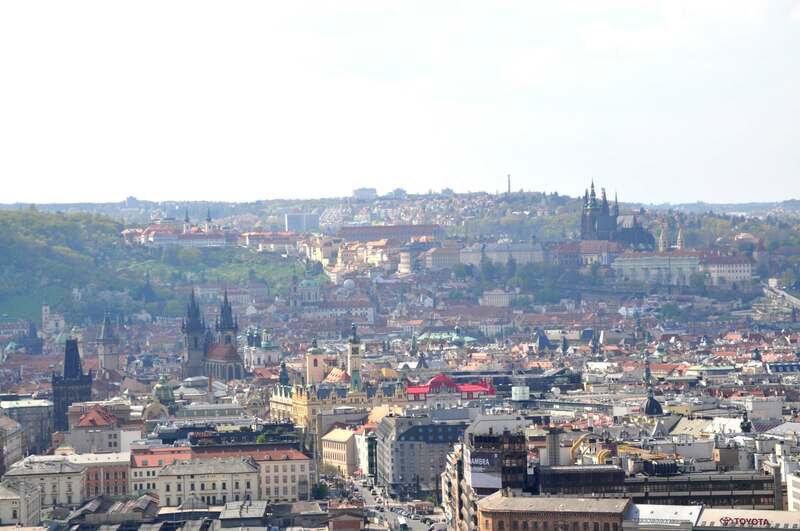 The most famous views to Prague are around Prague Castle and from Strahov Monastery. And believe me, that they are really very nice. But there are more places, from where you can have unexpected views that are worth seeing. View from Strahov, Vitkov hill is in the mist. Do you know where you should see the third biggest equestrian statue in Europe? 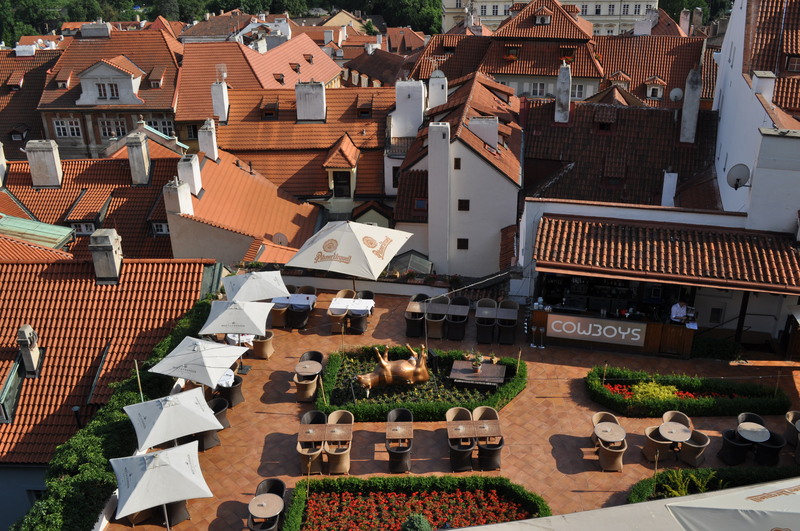 It is in Prague quarter Zizkov at Vitkov hill. For one year the statue was hidden due to restorations but this week it was uncovered again. Now you can enjoy Jan Žižka, the hussites Marshal, who won the battle on Vitkov hill in 1420 against the troops of emperor Zikmund the Red Fox. Hussites knocked down crusaders and now there is the statue of their Marshall. Behind the statue there is a huge Vitkov Memorial that used to be a mausoleum of our communist rulers (they wanted to be like Lenin). Now there is a Memorial to Unknown Soldier and exposition of Czech/Czechoslovak statehood crossroads, like Czechoslovak republic foundation in 1918, München treaty from 1938, communistic coup from 1948, invasion of Warsaw treaty armies in 1968 and newer history. Climbing the Vitkov Hill. But yes, you can get there from the other side with a tram. But we are here to enjoy one of the nicest views to Prague from the platform of the Memorial. 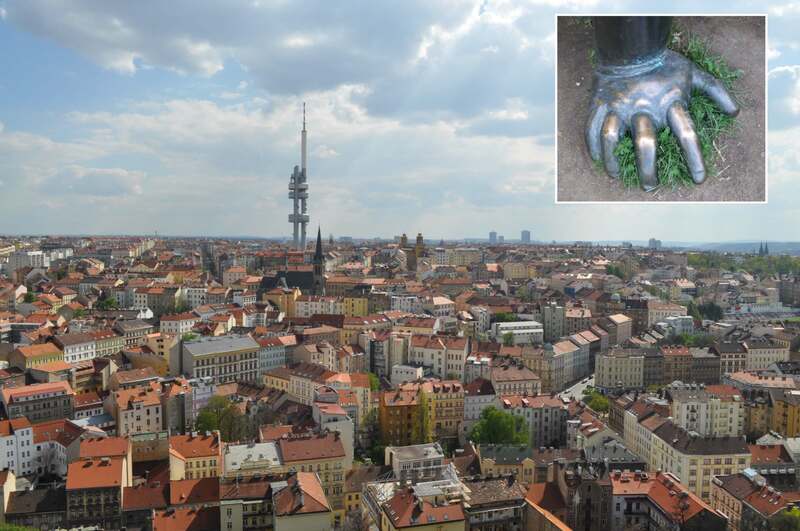 Your first view will be oriented to the city center and Prague area. In one view you can see Prague Castle with St. Vitus Cathedral, Strahov monastery on the left side , down in the City the Green Roofs of St. Nicolas Church at Lesser Quarter (the one with a big balloon on right side), Old Town hall Tower, Tyn Cathedral by the Old Town Square and also the Powder Tower and Municipal house down on your left. Almost on the horizon there is a big complex of hotel Praha. On the other side you see the roofs of Zizkov Quarter with Radio tower (another nice view from there) with babies climbing it. You can see the babies also in the Kampa Park, see how big they are from the hand. 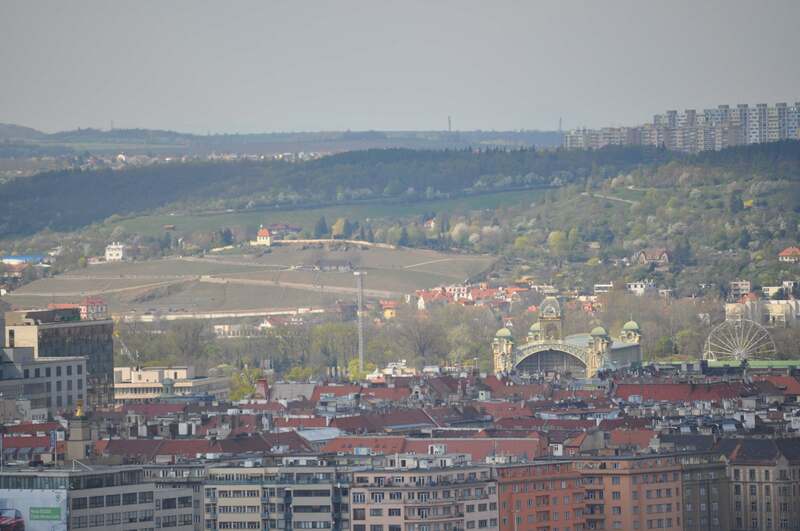 The next picture shows us the Troja and Bohnice (north Prague) direction with the beautiful Congress Palace right bottom, where also the amusement park is and in the middle the botanical garden with vineyards – the nice small shining church with red roof in the top of vineyards. Yes and from here, bellow the big houses on right horizon, there is another beautiful view to Prague, which is on my list of unexpected views. 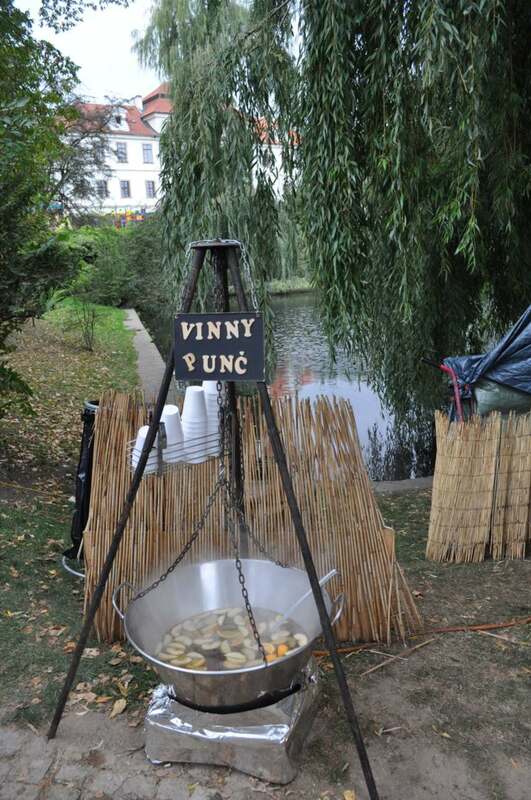 At the beginning of October you can visit Břevnov Feast. Břevnov is part of Prague behind the Prague Castle. There is the oldest monastery for monks in Czech Republic; it was founded by one of the first Czech patrons and saints St. Adalbert (Vojtěch) in 993. During 18th century the whole premises were rebuild in baroque style by the most famouse architects in Prague as Kryštof and Kilián Ignác Dientzenhofer‘s, Petr Brandl, Karel Josef Hiernle. The place worth seing and very nice opportunity to do so is during the October Feast. We visited this event with my husband and parents and also our small dogs yesterday. 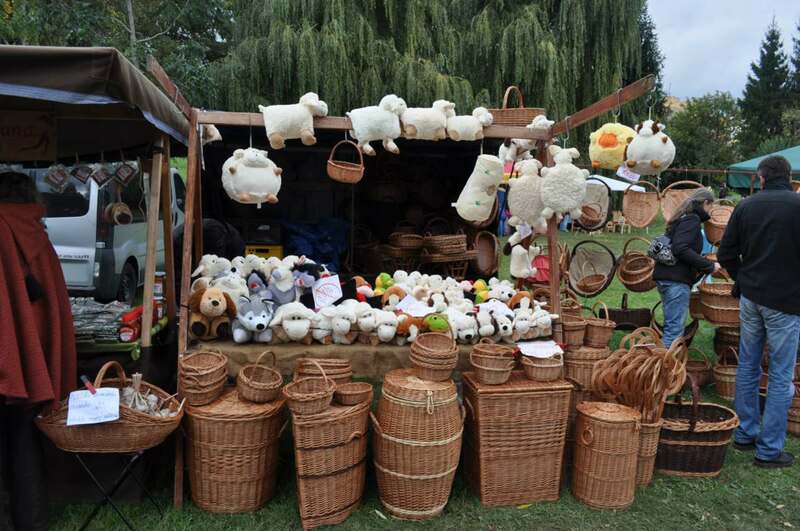 Hand made baskets and sheep pillows from wool. First we watched the attractions as carousels, shaggy, Bisley with paper flowers and cuddly animals, my husband won yellow hippo toy and flower for me. 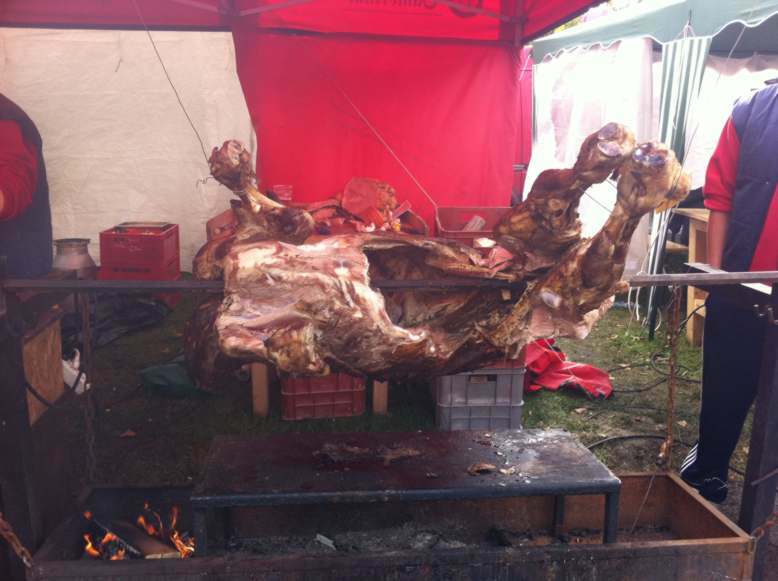 Fortunatelly we came to the place before the lunch, which appeared to be crucial, so we were able to enjoy the tastes of traditional Czech Feasts, as baked goose or duck, piece of grilled bull or ribs, cracklings, baked ham, typical cheese, dumpling, cabbage, potato pancakes. 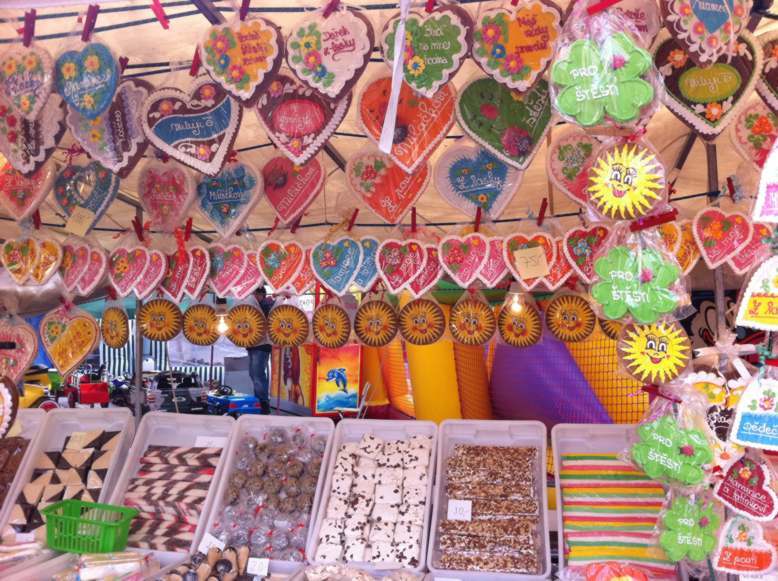 After that we checked also the sweets, as trdelnik, traditional Czech gingerbread, pancakes and many other types. 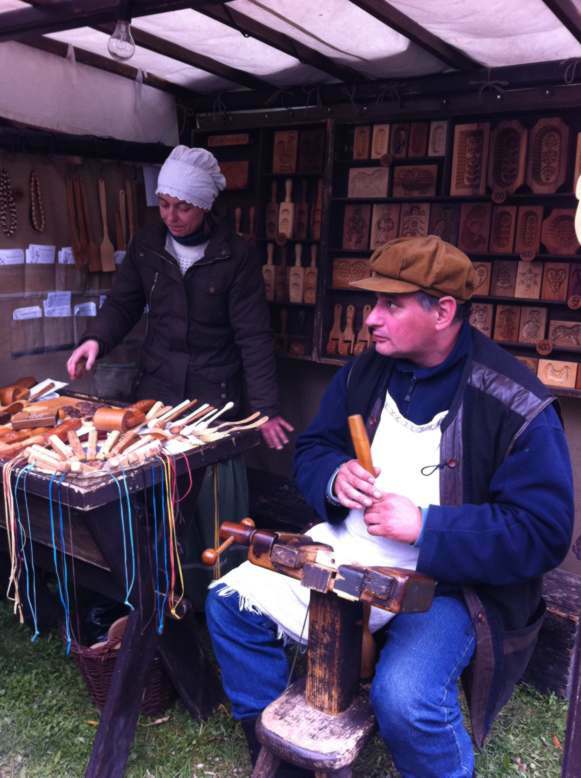 Carving wooden forms for butter or sweets. For drink we had to choose from several beers, there were several kiosks from different breweries and during the cold Sunday I was really grateful for non-alcoholic hot cherry beer from Bernard Brewery! My husband tried St. Adalbert beer brewed in the Monastery, it was rather good, but strong. Finally we arrived to the Old Czech Village, where we watched craftsmen creating some new piece of their art, like wooden form for butter or fragile glass figures. I really enjoyed our family afternoon; my favorites were manual coffee-roaster, the Santos there was brilliant; and kiosk with creative works from school-children from the area around Břevnov monastery. Don’t tell me, you don’t have your love lock yet! What? You don’t know what love lock is? When you come to Prague and walk on Kampa Island, for sure you should go to see John Lennon Wall. 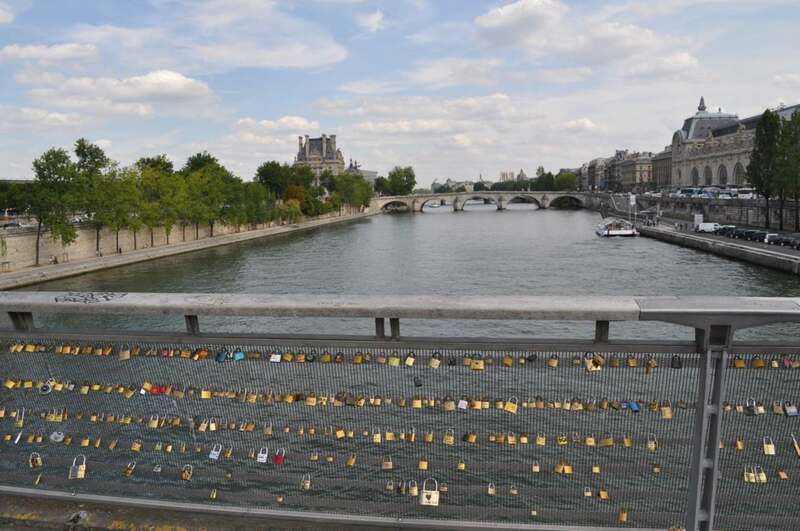 And there it is, the lovers bridge full of paddle locks. No, we are not that paranoid or afraid that someone will stole the railing from the bridge, the love-lock-mania just arrived to Prague as well. First I saw these love locks on the bridge between Vilnius (capital of Lithuania) and Uzupio (independent artists republic in the heart of Vilnius) in 2008. Some of them were really nicely decorated, with the names carved professionally in beautiful writing with small heart or flower added, some were just very ordinary locks with names carved with the nail. I was wandering, what they could mean and finally we (with my husband) came out with the conclusion, that it is very close to the story behind the locks. The legend varies from city to city, but we can abstract it as: if the couple in love / new married couple place the lock with their names (and date of wedding) to the railing on the bridge and then drop the keys to the water bellow, their love would be forever locked, extended and more precise story sais, you should lock it with your left hands and put the keys to the water together with your right hands (or was it the opposite hands?). This year we visited Vilnius again and we spent a nice Saturday here. You know, Saturday is the wedding day, I haven’t seen so many brides and groomes in my whole life and all of them stopped by the bridge and made their ritual with locks, carefully documented in photos. 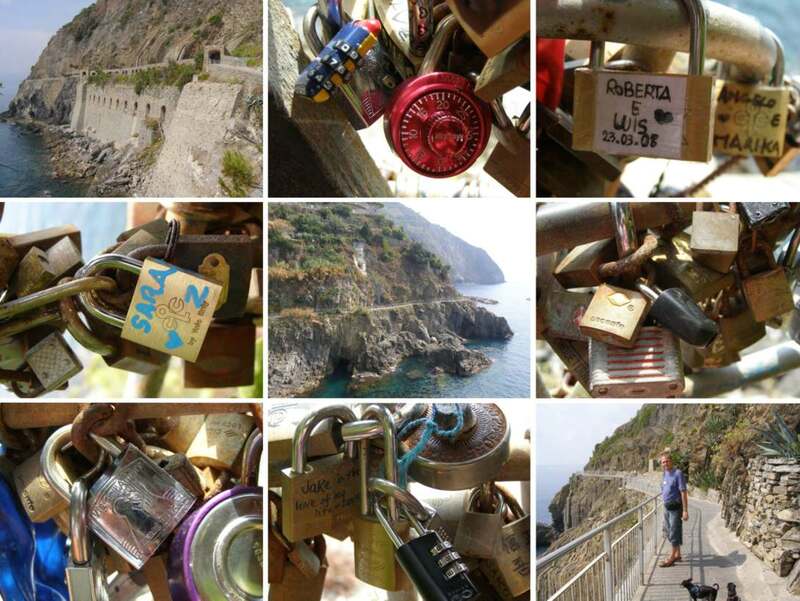 The next love locks I saw in Cinque Terre in Italy, on the railing on the walking route Via dell‘ Amore on the rocks above the sea between Riomaggiore and Manarola. Then I saw them in Paris on the bridge Passerelle del Solférino. 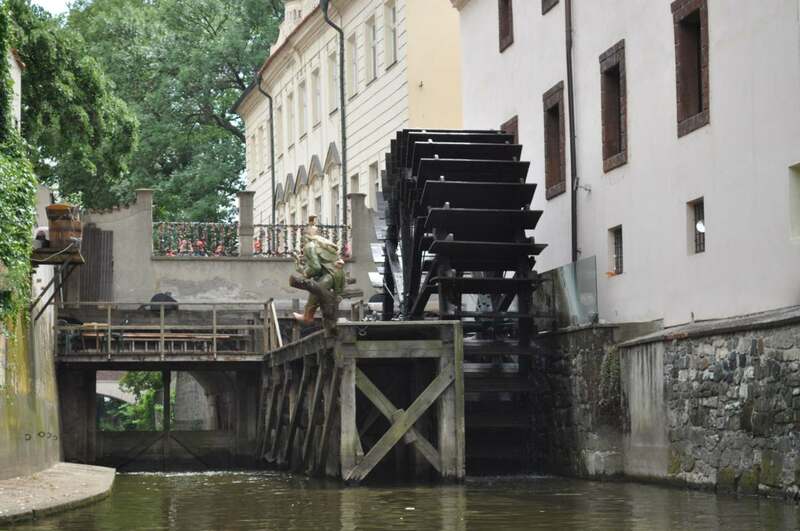 About two years ago the locks came to Prague, most of them you can find on the above mentioned Love Bridge between Kampa Island and Lesser Town. But the place is already overflowing by them (chains for more locks were add to the railing), you can find locks on almost every bridge in Prague, tight to the bar. 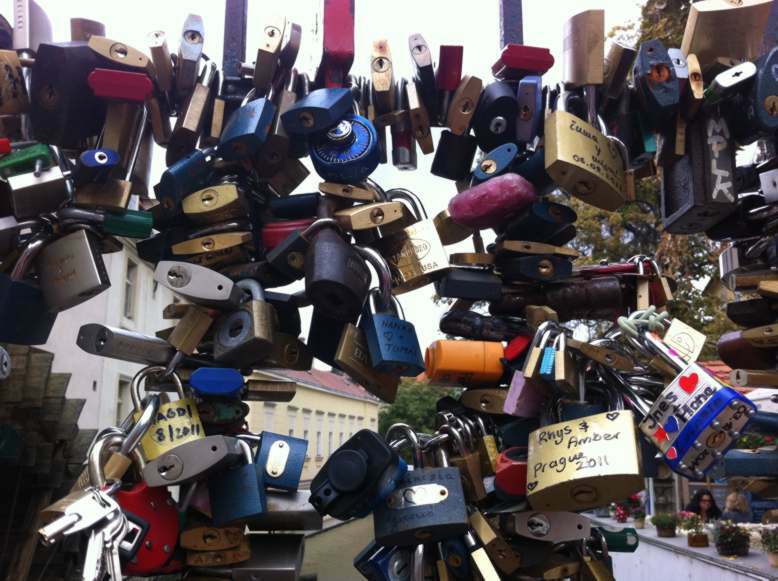 So don‘t forget to bring your love lock when you will come to Prague, for sure we will find it a nice place. 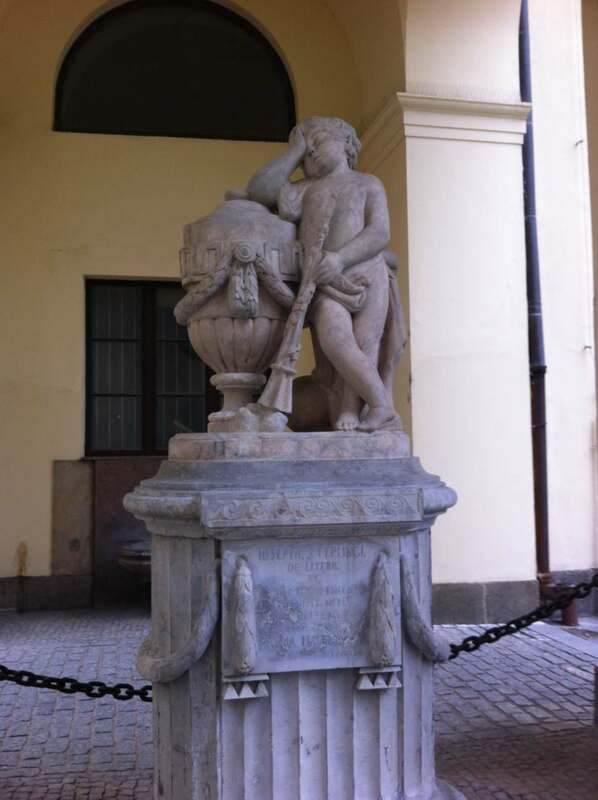 If you are geocacher, check this cache GC1ZZYW, it is only in Czech, but the final picture shows you, what you should look for. As a tour guide being in the Prague Castle I am always facing the dilemma, which way to choose to go down from the castle to the Lesser Town. 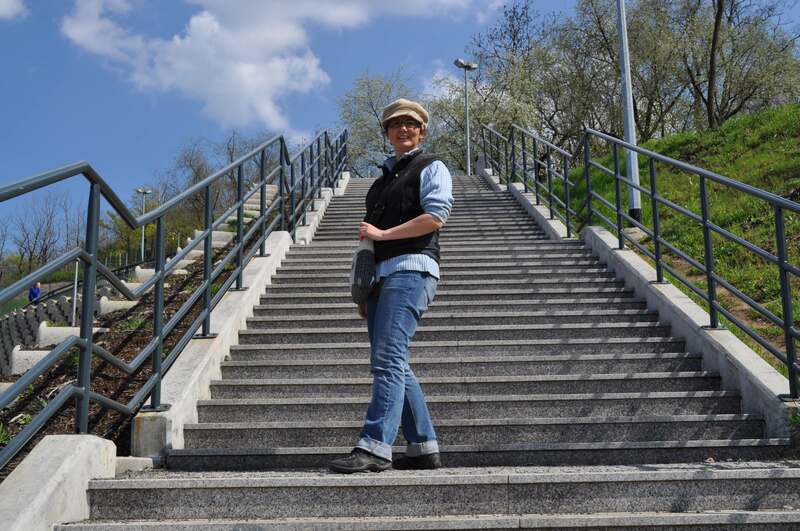 I’m not forcing my tourists to climb up the castle, which would solve the dilemma, we would go up with Neruda Street and down through the Opyš vineyards, but I prefer to go up with the tram and therefore I have to decide, which way to go down after the visit of Prague Castle? 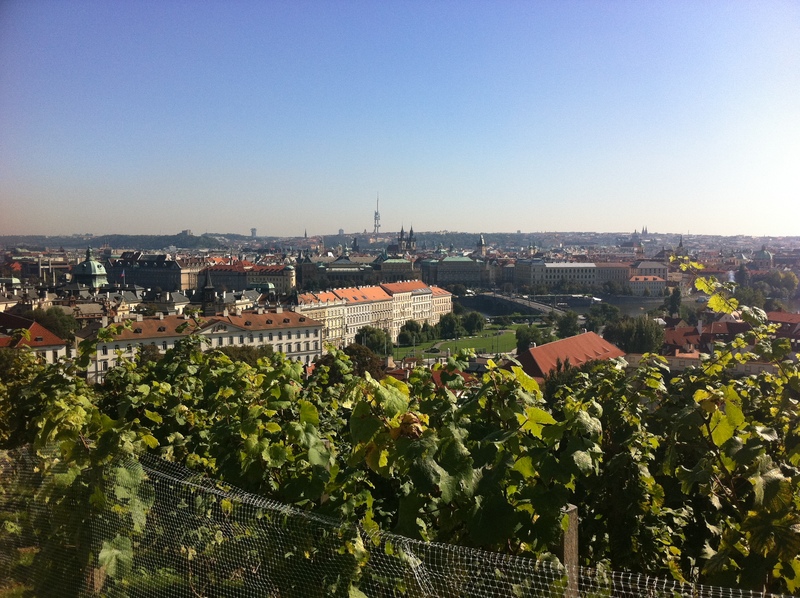 From the Opyš vineyards there are beautiful views to Prague, during autumn you can see how the grapes are growing, blue ones on your left hand, green ones on the right. You can buy a trdelnik (typical Czech hot sweet with cinnamon), see the beautiful Vallenstein Garden artificial wall, bridges on Vltava River, magic darksome Vyšehrad on the horizon. In a wine restaurant you can taste the wine produced here. The weakest place of this choice is the end of the route, which will spit you out to one of the most frequented car streets in Prague and you have to walk to Malostranská, where it starts to be nice again. You can go on to Kafka Museum in Herget Brick Factory (currently museum and restaurant) near the most narrow street in the Prague or visit Wallenstein Gardens with Adrien de Vries statues and artificial stalactite wall, looking there for small artificial frogs or snakes. On the other hand going down the Neruda street you can enjoy a cup of tea in Green Tearoom, check the nicest and oldest house signs in Prague (Two Suns, Golden Goblet, Three Violins); or hop over to the house of Donkey in the Cradle, where Magister Kelly was doing his hocus-pocuses, for the typical Czech pub food. 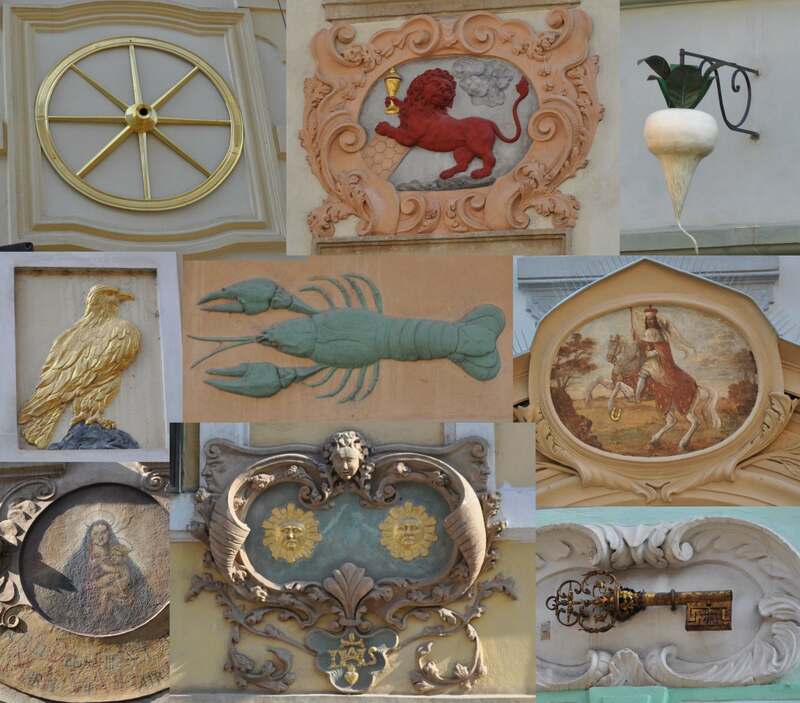 You can meet with works of Jan Blažej Santini, as Morzin Palace (the most significant high Baroque secular building), Church of Our Lady of Ceaseless Help and Thun Hohenstein Palace with two giant eagles around the portal. At the end you will stand on the Lesser Town square with beautiful St. Nicolas Church and then go on to the Charles Bridge or to pilgrim Church of Our Lady Victorious with Baby Infant Jesus. Which one or the route I will choose for you, you can check when you will come to Prague and contact me. I look forward to hearing from you.